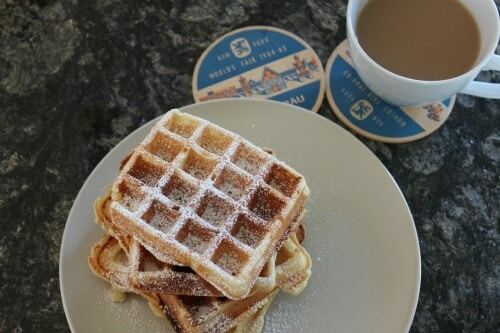 World's Fair Belgian Waffles | Good. Food. Stories. 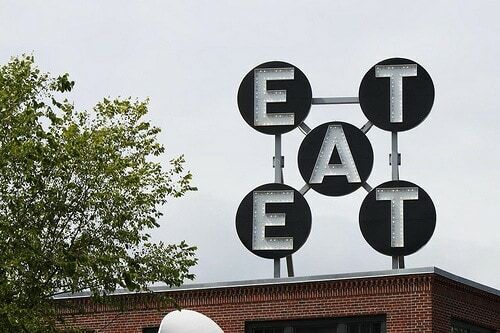 Let’s be frank, “EAT” is usually flashing in neon lights inside my head, though not usually visualized in huge blinking letters for the world to see. But that’s the word that confronted me from a twenty-foot-high retro sign atop the Farnsworth Art Museum last summer in Rockland, Maine. Turns out that the sign was a sculpture by Robert Indiana originally created for the 1964-1965 World’s Fair held in Flushing, Queens, newly restored and installed in a new home in New England. Indiana’s sculpture got me thinking about the food people did eat at the 1964 World’s Fair, leading me down a rabbit hole of research that culminated in my latest piece for Gourmet Live. While the Fair’s concession stands hawked the usual hamburgers and hot dogs, a financial screw-up kept a bunch of American food and beverage brands away from the pavilions. Cheap and exotic options like chow mein, sushi, kofte steak, tandoori, and Thai curry were readily available, however, and visitors ate them up—predating our current predilection for global cuisine, street food, and a casual approach to eating manifest in restaurants like David Chang’s Momofuku empire and Yotam Ottolenghi‘s cafes. But the runaway best-seller at the World’s Fair was the Belgian—or “Bel-Gem,” as it was called—waffle. Light and fluffy, the waffles were so popular that even stands with absolutely no culinary connection to the carbohydrate started offering them on the menu in hopes of cashing in. They popped up next to the falafel at the Lebanese restaurant, alongside egg rolls at the Hong Kong pavilion, with lines snaking down to the sidewalks. 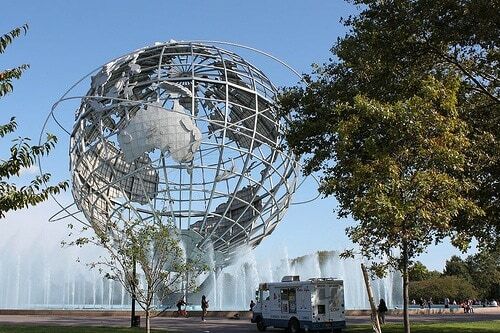 “it was a tidal wave, everybody had to have a waffle stand by 1965,” said Bill Cotter, World’s Fair expert and author. World’s Fair enthusiast Gary Holmes has traveled the globe eating his fill at fairs and expos over the past few decades, and tracked down Mariepaule Vermersch—daughter of the husband-and-wife team that brought the Bel-Gem waffle to America—who had been plying the family trade at the New York State Fair in Syracuse and at her coffee shop in Albuquerque. Though the Vermersch family sold the Syracuse location of Maurice’s Belgian Waffles (named after her father) and Mariepaule no longer runs her café, thanks to Holmes’ sleuthing, I’m happy to share the recipe he uses for waffles with the authentic taste of those sold at the 1964 World’s Fair. Adding yeast to the batter gives the waffles a malty tang and a crispy exterior that Bisquick or baking powder alone just can’t compete with. Letting the batter rise for an hour might seem like an excruciating wait, especially when you’ve got a crowd of brunchers ready to stab you with a fork, but just think: it’s nothing compared to the long lines of waffle addicts waiting in the summer sun at the World’s Fair. For a true Fair feel, top with powdered sugar, whipped cream, and strawberries. Heat the milk in a small saucepan over low heat until warm to the touch but not steaming or bubbling. Measure out 1/4 cup milk (into the proper measuring cup, of course) and sprinkle the yeast over the milk. Stir gently and let sit for 10 minutes. Melt the butter in a small saucepan while the yeast dissolves. Whisk the melted butter, the dissolved yeast, sugar, salt, vanilla, and egg yolks together in a large bowl. Whisk in the remaining milk, then gently stir the flour into the batter with a wooden spoon. It will be slightly lumpy. Cover the bowl with plastic wrap or a damp towel and let the batter rise in a warm place for an hour. Heat your waffle iron and cook your waffles according to your appliance’s specifications. For me, that’s 1/4 cup of batter on a piping-hot iron, cooked for about 5 minutes. Your mileage may vary. Serve immediately or freeze, wrapped in foil, to reheat in a toaster oven.